Cima Dome is famous for its remarkably smooth dome shape. At one time, Cima Dome was a rugged, craggy mountain. How did it become so rounded? The story starts with the granite it’s made from. 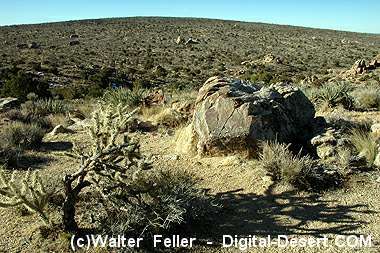 Mojave’s granitic rocks started out as great masses of molten rock called magma, deep beneath the Earth’s surface. Vast expanses of solid minerals and simmering magma once fed explosive volcanoes miles above. Not all of the magma erupted at the surface. Much of the fiery mass remained trapped deep below miles of rock, allowing it to cool and solidify very slowly. With plenty of time to grow, large crystals formed, giving granitic rocks their distinctive coarse, grainy texture. Many millions of years later, tectonic forces lifted these deep rocks to the surface, forming a high mountain range. Once exposed at the Earth’s surface, other forces, weathering and erosion, began the work of breaking the mountains down. Once at the surface, granite falls victim to the slow, gnawing forces ofweathering and erosion. Water falling on the rock as rain or snow and groundwater percolating just beneath the surface begins to disintegrate the rock grain by grain. Water and dust particles gradually work their way between individual mineral grains. Mica and feldspar grains in the granitic rock chemically react with the water and decompose to form clay minerals. Clay minerals and dust tend to swell-up when they get wet, then shrink when they dry out. These tiny particles act as wedges between more chemically resistant minerals, prying them loose from the solid rock, like the potassium feldspar grains in the image on the right. Over time, the granite ‘rots’ and streams begin to carry away the loose, rotten granitic soil. Eventually, the mountain retreats back, leaving a gently sloping surface behind. Over millions of years mountains can retreat so that just a few exposed boulders remain, like those you see on the top of Cima Dome. 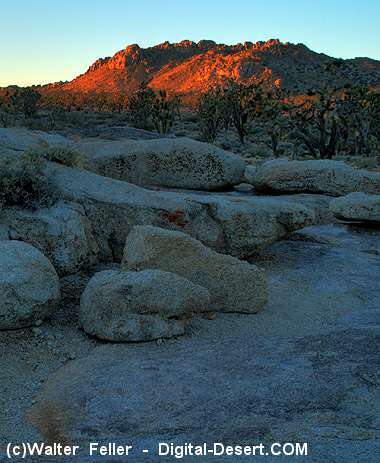 The northern area includes Ivanpah Valley, south of Nipton Road, including the areas north, west and south of Cima Dome, extending up to Interstate 15. 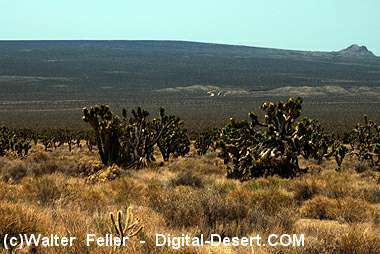 Cinder Cones National Natural Landmark. The skyline of Cima Dome is interrupted by the conical outlines of dozens of remarkably well-preserved . The skyline of Cima Dome is interrupted by the conical outlines of dozens of remarkably well-preserved volcanic cinder cones and black basalt lava flows.